In this post, Heather Woodie of Blog, She Wrote outlines the process of conducting a flower dying experiment in your classroom or homeschool. With a few simple materials, you can teach your kids about the movement and size of molecules as well as the internal structure of flowers. For additional support, check out our reading resources on the Growth Cycle of Flowers and Chemistry in Nature. Chromatography separates components of mixtures based on the size of the molecule. It’s easy to perform chromatography using coffee filters and black felt tips pens. 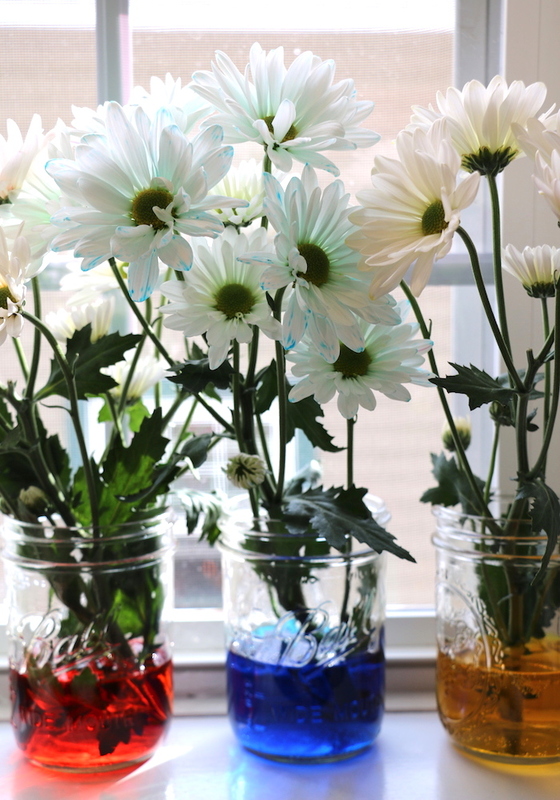 For a little variation, try using cut flowers in water with your students. Add some spring flair to your chemistry lessons using fresh white flowers and food dyes. 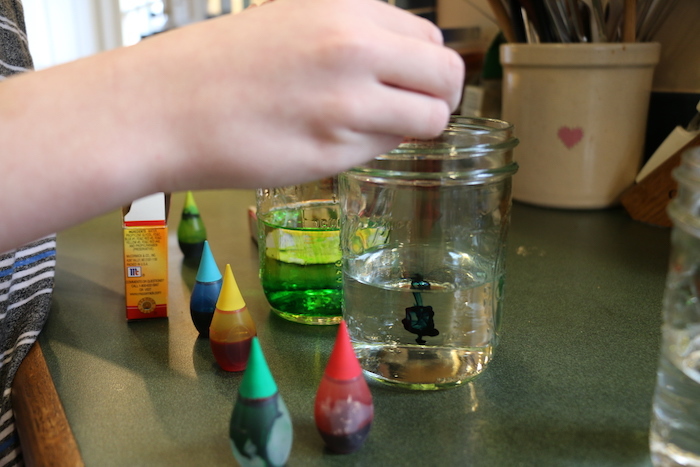 Make sure as water levels drop, you replace the colored water in each jar at the same concentration. Make a hypothesis. What do you think will happen when the flowers are placed in the colored water? Don’t forget to tell why. Place the same number of drops of food coloring into each jar. Make sure the color is defined. Cut the flower stems to a length appropriate for the jar you are using and place several flower stems into each jar. Observe. Check the flowers over the time the same day and into the next few days. Discuss with students what is happening to the flowers. How does the coloring get into the flower petals? Do you observe any differences between the flowers that are in the primary colors versus flowers in the secondary colors? Which color reaches the end of the petal first? The purple dye is separated in the flower petals into its components of blue and red. Which color reaches the end of the petal first? What can we infer about the size of the blue and red dye molecules based on their position on the flower petals? Think about why the primary colors show no color separation. Based on what you understand about chromatography, why is this no surprise? It’s important to note that chromatography in living systems may behave differently than its chromatography paper counterpart. Molecules may appear slower because they can meander into places along the way that other molecules cannot. They eventually catch up. This matches our observations because even though the blue and red dyes separate, with the red dye lagging, eventually they come together again in the ends of the flower petal as they turn purple. 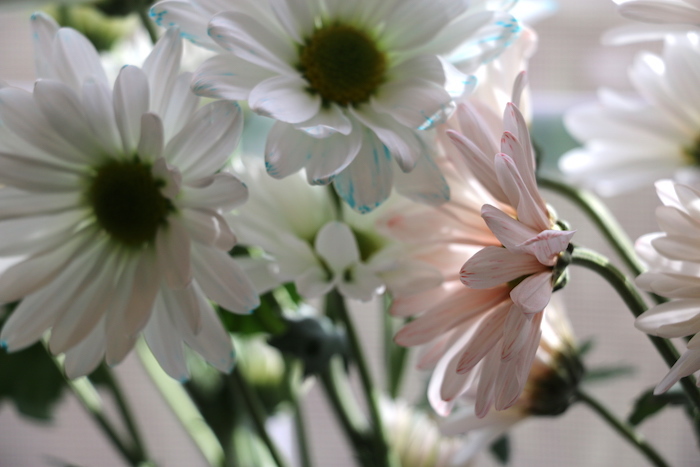 Flower chromatography is a great activity for setting up and leaving in the window sill to watch throughout the week. Step into spring with a fresh STEM activity!